The SPLAT Project Amphibian Tunnel: Why did the Red-legged Frog cross the road? To get to the other side, of course! No one has been able to get a straight answer out of the frogs on this question, but a number of people have tracked their movements over wide areas. In Oregon, Marc Hayes and his colleagues caught and marked Red-legged Frogs at a breeding pond in February and then recaptured one 4.8 km away, six months later. This frog likely traveled back to breed at the same pond the following winter. No one knows exactly why frogs move so far. Perhaps it is to find better food and shelter. Or maybe to escape from predators. It's likely a combination of factors. One thing we do know, if there is a road to cross along the way, frogs will attempt it. Unfortunately, not all of them make it, without some help. 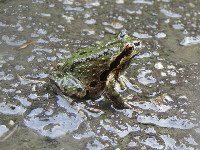 This year, since August 31, the Wetland Stewards for Clayoquot and Barkley Sounds have safely moved 400 Red-legged Frogs across Highway 4. Most were juveniles, dispersing 500 m away from the shallow lake where they were born last spring. Some were adults returning to the breeding site. We installed plastic fences along 90-m sections of the highway to block frog access to the road. We caught, measured and marked each individual at the fence before releasing it on the opposite side of the road. We rarely caught the same individual again. Juveniles moved on to wherever they will spend time, over the next two to four years, before returning to breed at the lake. Adults moved towards the lake where they will breed in February. The fencing works well except that it prevents the natural migration and dispersal behaviour of frogs, unless people are involved in catching and moving them across the road. A better solution would be a raised highway or a series of tunnels to provide safe passage under the road. The Wetland Stewards are working with the B.C. Ministry of Transportation and Infrastructure to design an experimental tunnel. Our first step was to decide where to install the tunnel. To answer that question we asked: "Where did the Red-legged Frog cross the road?" That's a relatively easy question to answer. By surveying the 40-km highway between Ucluelet and Tofino by car on warm rainy nights from 2000 to 2004, we located the highest concentration of roadkill along a 1.5-km stretch. Searching on foot, we found the highest concentrations within that 1.5-km stretch. In 2005, we set up the 90-m barrier fences to catch frogs and pinpoint where the majority of crossings occur. Now we know where that is, and we're designing a tunnel that will fit the roadbed at that location. More about that in the next post.